PP is one of the best mobile racebooks for racing fans who want to be able to place bets and watch live horse racing on their smartphone or tablet. PP will also double the first bet you place from a mobile device. Paddy Power have quickly grown to become one of Europe's largest bookmakers by offering their customers innovative new products. Paddy Power Mobile features a first rate racing section, that offers independent Racing Post betting advice, tips from leading jockeys and experts, interactive form guides and racecards, plus guaranteed prices. While most mobile bookmakers only offer live streams of horse racing from racecourses in the United Kingdom and Ireland, Paddy Power have gone one step further by offering live video of races from South Africa, South America and Dubai. Paddy Power Mobile works on iOS, Windows Phone or Android devices. Ladbrokes are the oldest bookmaker in the United Kingdom. The Ladbrokes brand has always been synonymous with horse racing in the United Kingdom. Since 2005 they have been sponsoring the World Hurdle Grade 1 race at the Celtenham Festival so it should come as no surprise that horse racing is one of the focal points of the Ladbrokes bookmaker app. 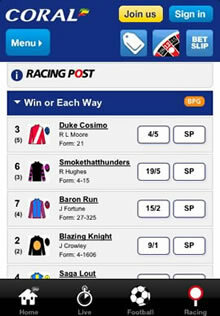 The home screen of the Ladbrokes app gives users quick access to every upcoming race. The racecard contains a form guide, including each horses Racing Post Rating (RPR). 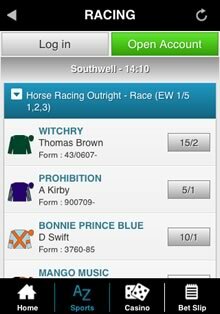 A variety of independent betting tips are also available by scrolling to the end of each racecard. The days racing results are easily accessible along with forecast dividends for each race. Watch live horse racing from Great Britain, Ireland, Africa and the United Arab Emirate from your iOS, Windows Phone or Android smartphone/tablet. BONUS: When you place your first racing bet, Ladbrokes will match it up to £100. Coral have done an excellent job in developing a first rate horse racing apps. The standout feature for us is the racecard, which looks great, is easy to navigate and contains a wealth of information on every race, including an independent synopsis of every race provided by the Racing Post. Place a wager of just £1 on any U.K. horse race and watch a live video stream of the race on your Android, iPhone, Blackberry, iPad or Windows Phone. BONUS: If you create a new account with Coral today and place a wager on any horse race, Coral with match it with a free bet of up to £/€50. Sky Bet are part of the Sky broadcasting corporation whose Sky Sports channels broadcast Premier League soccer, golf, cricket, rugby league/union, darts, ice hockey, boxing, Formula 1 and more. Their sports betting app enables users to bet on over 600 horse races each week and watch live streams of all Racing U.K races on iPhone, iPad or Android. BONUS: What sets Sky Bet apart from their competitors is their easy to claim, no strings attached free bet offers. When you create a new account with Sky Bet, £10 is automatically waiting in your betslip when you login for the first time. You are free to use this £10 bet on any horse race or sporting event you like and there is no requirement to make a deposit. In addition, if you place a £5 bet ever week, Sky Bet will match it and give you an additional £5 free bet completely free. StanJames is one of the UK's oldest bookmakers. Traditionally they've specialised in football and horse racing and this also carries through to their mobile offering, which has a strong racing focus. Not only does the StanJames app cover UK and Irish races, but they also feature racecourses from Australia, America, Asia, South Africa and other parts of Europe. Unfortunately, the racecard lacks the depth of information you will find using similar apps and it lacks a proper tipping section. Although live streams of the Racing UK and At The Races TV channels are available via the main website, this service hasn't been extended to their mobile site yet. BONUS: If you place a £10 one any race, StanJames will give you another free £10 bet. BetVictor (formerly known as VC Bet and Victor Chandler) are a UK bookmakers with a reputation for delivering extremely generous horse racing offers. Take an Early Price or Board Price via the mobile app and if the Starting Price is bigger BetVictor will pay you at the bigger price. Compatible with iOS, Android, Blackberry, Nokia, Windows Phone and more. A dedicated tablet version is also available for the iPad and iPad Mini. 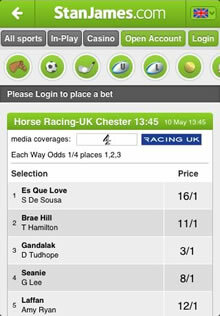 Bet £1 on any race and watch a live streams of either At The Races or Racing U.K on your iPhone or Android. BONUS: BetVictor will match the value of new customers first bet up to £25. Looking for a United States friendly horse race betting app? Click Here to visit our U.S. 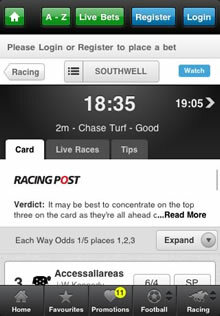 Mobile Racebook page. In the United Kingdom and Ireland horse racing punters can choose from any number of betting shops on their local high-street. As a result, horse race bettors have been relatively slow to adopt the latest mobile technology in comparison to casino and poker players. Bricks-and-mortar betting shops have traditionally been the home of serious racing punters because they are a great way to socialize with other racing fans and pick up tips for upcoming races. Their dominance now appears to be slipping as racebook apps for devices like the iPhone, Samsung Galaxy S5 and Nokia Lumia become more and more sophisticated and offer features that are just too good to ignore. Here are just a few reasons why you should try our featured mobile bookies. In the past if you wanted to get racing tips you needed to pop down to your local bookies or or racecourse in order to get the word on the ground. New dedicated tipping apps are now available for both iOS and Android devices that combine the betting knowledge of thousands of tipsters to help you beat the bookies. Tips success rates are ranked in a table, which makes it super easy for you to follow the most profitable gamblers who consistently pick winners. 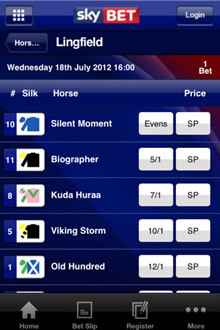 The William Hill racing app contains a "Top Bet" sections which shows the top 10 most backed horses at any given time. This can often be a good indicator of which horses are most fancied and where the smart money is going. Paddy Power Mobile provides tips from top-level jockeys, including Barry Geraghty, Tony McCoy and Ruby Walsh. 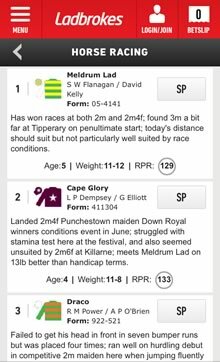 The PaddyPower racing app also contains a summary of the days racing tips and NAPS from publications like the Racing Post and Irish Field. One of the greatest pleasures in life is being able to watch the horse you've backed romp home to victory. Even though terrestrial television channels like the BBC, Channel 4 and RTE broadcast major race meeting like the Cheltenham Festival, Royal Ascot and the Grand National, if you want to want to watch regular horse races live from around the globe, you'd need to go to your local betting shop to see a live feed. Thankfully those days are now in the past and it is possible to watch racing on your iPad or HTC One from racetracks like Churchill Downs (Kentucky Derby), Flemington Racecourse (Melbourne Cup) and the Meydan Racecourse (Dubai World Cup). A variety of live streaming applications are now available that cover racing in the UK, Ireland, United States and Australia. We all know that certain horses run better on particular types of ground conditions. Some prefer when the going is heavy, soft or yielding, while others perform better when the going is to good, good to firm or firm. The Coral for iPad app now provides racing punters with 5-day forecasts and ground condition reports for individual racetracks which could greatly improve your odds of placing a winning bet. If you prefer to choose which horses to back and not rely on tips from racing insiders, you'll need to get your hands on a racecard in order to make an informed choice. You could spend money on a newspaper if you wished or alternatively you could just use the free racecards available from every bookmaker app. These racecards provide information on the horses name, weight, position to starting pole, owner, jockey, trainer and most importantly a form guide. The form guide provides detailed information on how the horse performed in its last four runs. Helpful comments and summaries are also available to help you make the right decision. Many people who never had a computer now own a smartphone. The ubiquitous nature of smartphone has meant that bookmakers are eager to get their customers to install their mobile software on their Sony Xperia or Google Nexus devices. Competition is so fierce between the gambling companies that they've even stared to offer enhanced horse race betting odds to their mobile customers. This means that you'll get more money on a winning horse when you place a mobile wager. Are these racing apps available on Blackberry Z10 or Windows Phone Nokia Lumia devices? The good news is virtually every bookmaker now offer a browser-based version of their iTunes App Store app that can be accessed from the browser of any iOS, Android, Nokia or Blackberry tablet or phone. I live in the United States? Can I download and use these horse racing apps? Even though the major European bookmaker like William Hill do no currently welcome real-money gamblers from the United States, U.S. citizens still have access to a number of racebook apps that offer many of the same features. You can get the most up-to-date list of here. Apps that only provide news, tips, live video/replays and form guides can be downloaded and installed on any iPhone, iPad or Android device in the USA.